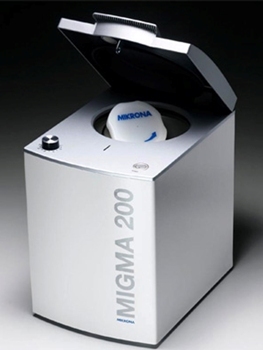 Manufactured by Mikrona Ag of Switzerland, the first Migma was a star attraction at the Adelaide Dental Exhibition where it was first demonstrated, however the price which was fixed by the manufacturers proved to be a major obstacle to the sale of the machine. Over the next few years we were able to persuade the manufacturers to let us set a price that was more acceptable to the local market, this precipitated a number of sales of the machine to private and public clinics where the machine proved its worth time and again. Today the Migma 200 which is the latest model, is equally efficient but much more reasonable in price. 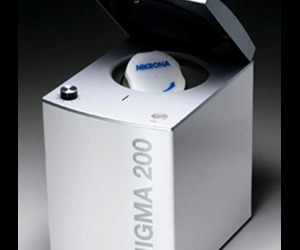 Unlike many of the cheaper Asian copies which have flooded the market, the Migma 200 is a reliable and long lasting machine, as was its predecessor. We now have customers who are still using machines which they purchased over 15 years ago. Miniflam Australia Pty Ltd are not only the importers and distributors of the Migma 200 but we also carry out all repairs and maintenance on the equipment. True to the quality expected from a machine designed and manufactured in Switzerland, the Migma 200 is a piece of equipment which when properly maintained can be expected to deliver high quality impression mixes in alginate and zoe for many years to come.